I was at Trader Joe’s and yes I know your surprised and I found pizza dough. 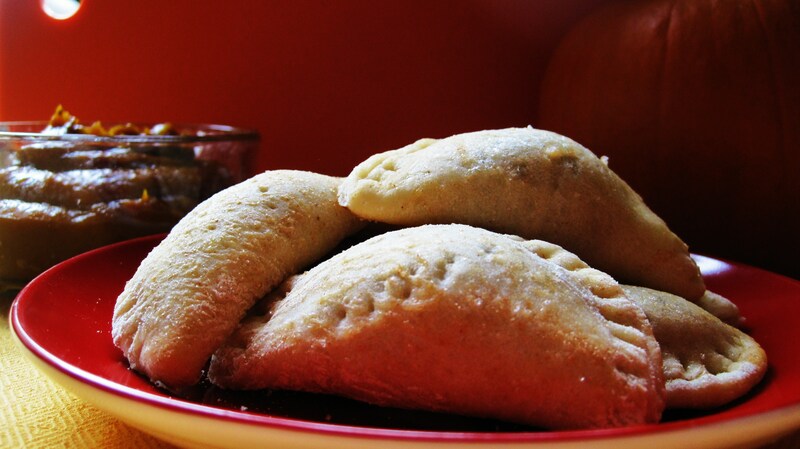 I automatically thought Pumpkin Empanadas, but to my surprise I didn’t get empanadas, instead I got bites of little pumpkin filled pillows. 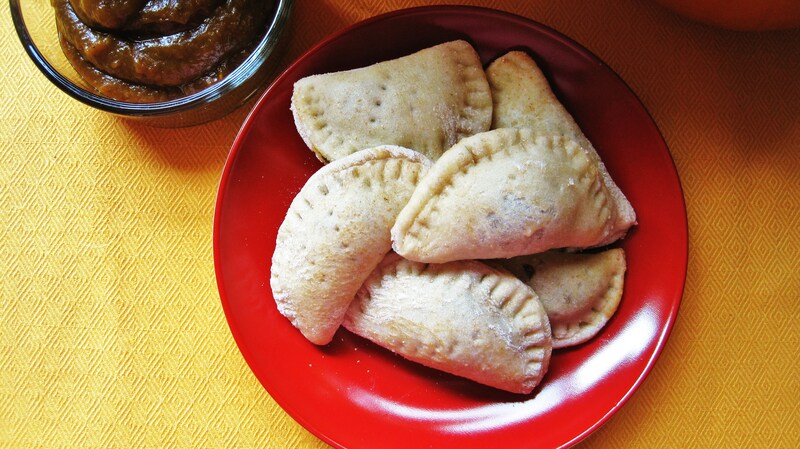 Why Empanada you wonder? See back when I was 16, I worked at Mighty Taco and for those of you who have no clue what Mighty Taco is, it’s a WAY better Taco Bell. Mighty Taco is a chain restaurant in Buffalo, NY. Every fall Mighty Taco would have a seasonal empanada and in the fall it was pumpkin in the spring it was cherry. I loved those fried buggers, sprinkled with cinnamon and sugar. Thats where I got empanada idea from. My favorite was the cherry with pumpkin coming in 2nd. 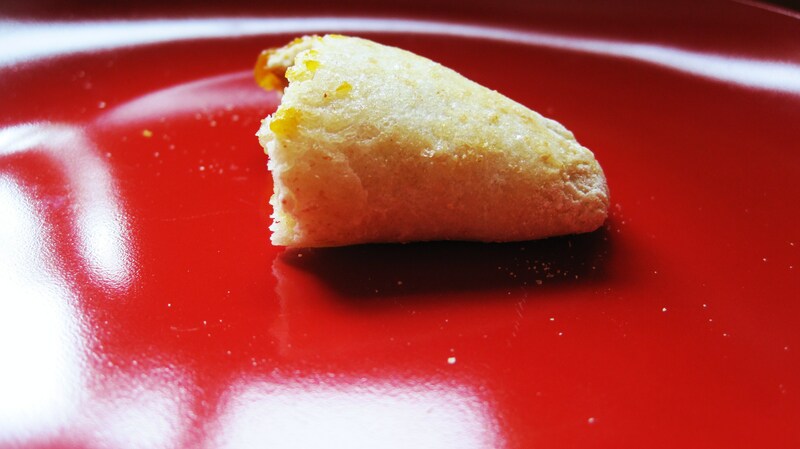 Since I didn’t use pastry dough (I’m bad with pastry dough) I used pre-made pizza dough instead, my empanada’s are more like little breads, filled with pumpkin(you know that gives me an idea in the future). They are so tasty and easy to pop in your mouth and better yet there easy to make. You could also do this with your favorite jams, like Raspberry, Strawberry or go spicy with Jalapeno Jelly. Ok, I think I am going to make these with Jalapeno Jelly, topped with cheese. Man! Now I need to get more dough, that sounds so good!! Imagine it served with chili. Yum! Here are the steps. Thats the pizza dough rolled out. I used a lot of flour, since it was sticky and sticking to my rolling pin. 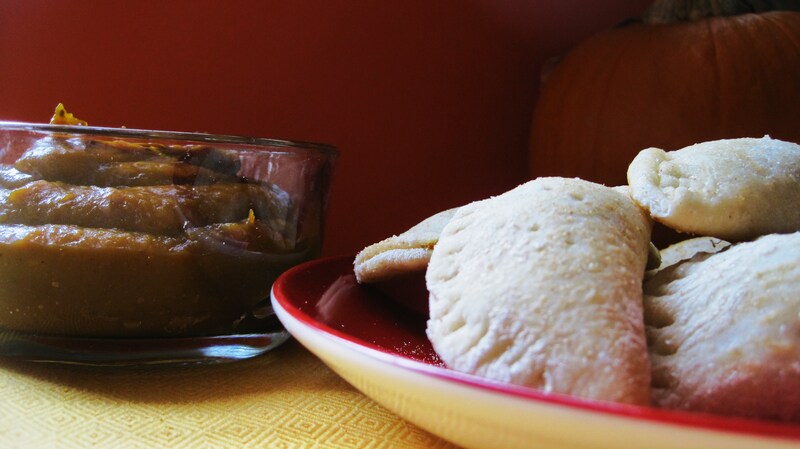 I used the bottom of the canned pumpkin to shape my empanada’s. I placed a small dollop of filling onto each little circle. Using pizza dough, it was easy to stretch over. I used a fork to seal the edges and poked little holes in the middle to let steam escape. I brushed them with egg white and sprinkled some sugar on top. Placed them a 350 degree oven for 20 minutes. Then I let them cool on a baking rack. They just came out of the oven. I’ll serve them with the left over filling,which is perfect! They taste like little pumpkin pies. In a small sauce pan add butter. Once it’s melted add your brown sugar and stir till sugar is dissolved. Add pumpkin and spices and stir till thick. Give it a taste to make sure you have enough spices. Let it cool for a few minutes and then place in the fridge till you need it. You will have plenty of filling left over to dip your empanadas in. Prep 2 baking sheets with Parchment Paper. 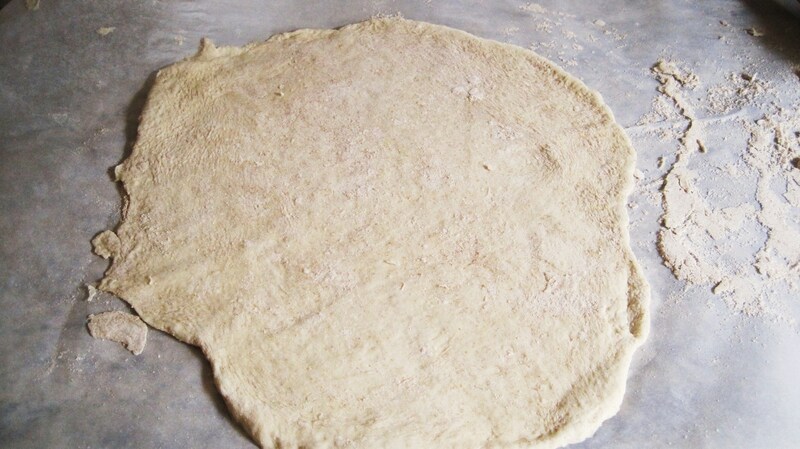 On a floured surface, cut your dough in half. It’s easier to use that way. Roll your dough out until thin. 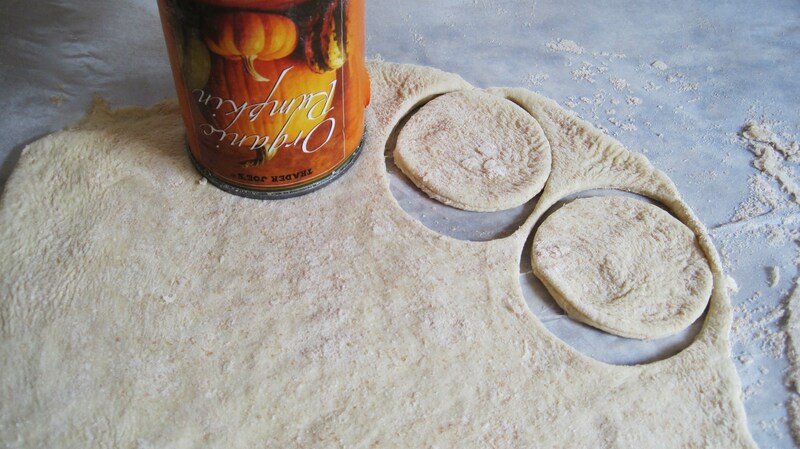 Use a round cookie cutter or the bottom of your pumpkin can to cut out circles. Place the circles onto your baking sheet. Once all cut out, take your filling and add it to the middle of your dough circle. I would guess about 1/2 tsp. Fold over the circle to make a half moon shape. Seal the edges with a fork. 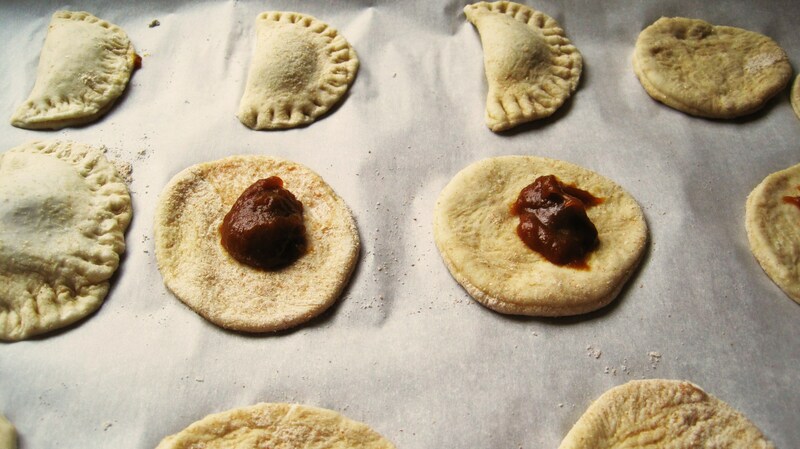 If the dough is sticky, just dip your finger into a little flour and rub it along the edges. Poke a couple of holes on top of the empanada to let steam escape. Brush with egg whites and sprinkle with sugar. Bake in the oven for 15-20 minutes. Mine took 20 minutes. Let them cook on a baking rack and then serve with remaining pumpkin filling. The calories will be less then what I am telling you because there was a lot of filling left over and that’s hard to calculate. It’s better to be higher on count then lower. 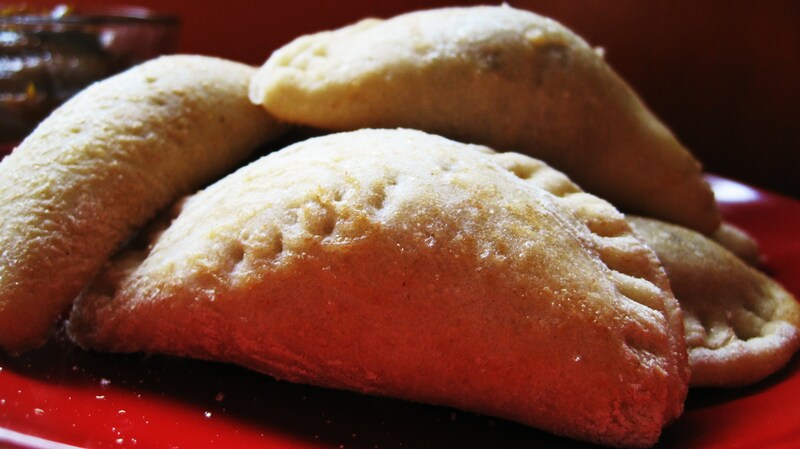 Just to give you an idea, One empanada is under 45 calories (dough alone is only 34 calories each), add about 1 tsp of the left over spread with an empanada and this is what your calories should be about. There not to bad of stats. Nice! This weeks other pumpkin recipes. So cute! I work at TJs and sometime we make those in demo with the puff pastry. Thanks! I should try the puff pastry, I know that our Trader Joe’s just started to carry it. Okay, yum! Now I know what to do with left over pumpkin puree! Never thought of using a can to cut out circles. Gr8 thinking. 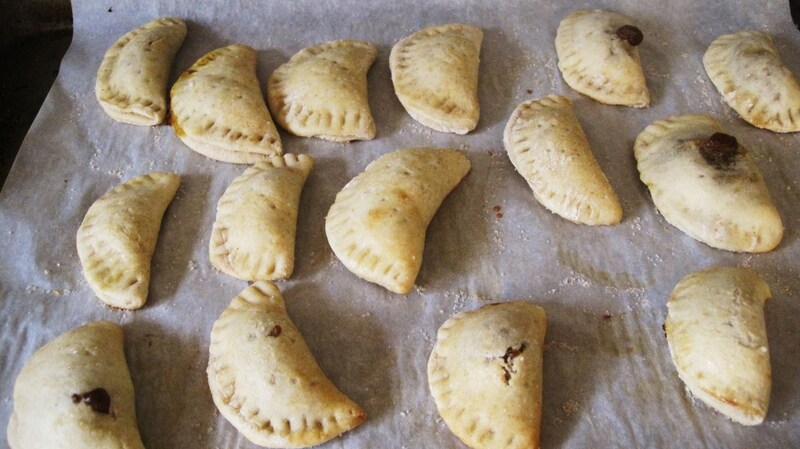 Last time I made empanadas, I made soyrizo, potato and spinach ones.